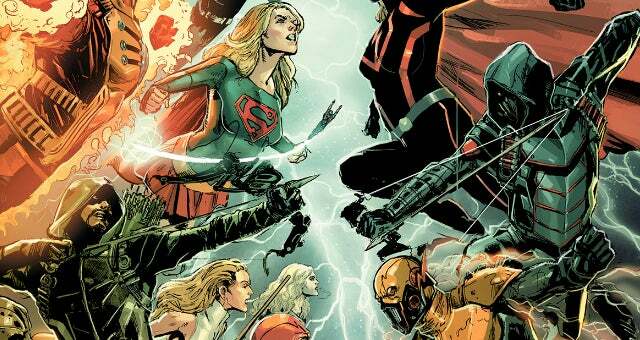 The CW has released the official descriptions for the four-part "Crisis on Earth-X" crossover set to air in three weeks across Supergirl, Arrow, The Flash, and DC's Legends of Tomorrow. The crossover, which last year marked The CW's highest-rated week of programming in years, sees the full breadth of The CW's DC superhero cast teaming up, this time to battle an incursion from Earth-X, an alternate timeline in which Nazis won World War II. You can check out the official synopses below; they are all materially the same, and provide little new information, except the names of the writers and directors of individual crossover episodes. THE EPIC FOUR-WAY CROSSOVER WITH “ARROW,” “SUPERGIRL,” “THE FLASH” AND “DC’S LEGENDS OF TOMORROW” BEGINS — Barry (guest star Grant Gustin) and Iris’s (guest star Candice Patton) wedding brings the gang together, but things go awry when villains from Earth-X attack the ceremony. All of the superheroes band together with help from their super friends like Citizen Cold (guest star Wentworth Miller), The Ray (guest star Russell Tovey), Felicity Smoak (guest star Emily Bett Rickards), Iris West and Alex Danvers (Chyler Leigh) to take on their most formidable villains yet. Earth’s mightiest heroes – Green Arrow (guest star Stephen Amell), Supergirl (Melissa Benoist), The Flash (guest star Grant Gustin) and White Canary (guest star Caity Lotz) – lead their teams into battle to save the world. Larry Teng directed the episode with story by Andrew Kreisberg & Marc Guggenheim and teleplay by Robert Rovner & Jessica Queller. THE EPIC FOUR-WAY CROSSOVER WITH “ARROW,” “SUPERGIRL,” “THE FLASH” AND “DC’S LEGENDS OF TOMORROW” CONTINUES — Barry (guest star Grant Gustin) and Iris’s (guest star Candice Patton) wedding brings the gang together, but things go awry when villains from Earth-X attack the ceremony. All of the superheroes band together with help from their super friends like Citizen Cold (guest star Wentworth Miller), The Ray (guest star Russell Tovey), Felicity Smoak (Emily Bett Rickards), Iris West and Alex Danvers (guest star Chyler Leigh) to take on their most formidable villains yet. Earth’s mightiest heroes – Green Arrow (Stephen Amell), Supergirl (guest star Melissa Benoist), The Flash (guest star Grant Gustin) and White Canary (guest star Caity Lotz) – lead their teams into battle to save the world. James Bamford directed the episode with story by Marc Guggenheim & Andrew Kreisberg and teleplay by Wendy Mericle & Ben Sokolowski. THE EPIC FOUR-WAY CROSSOVER WITH “ARROW,” “SUPERGIRL,” “THE FLASH” AND “DC’S LEGENDS OF TOMORROW” CONTINUES — Barry (Grant Gustin) and Iris’s (Candice Patton) wedding brings the gang together, but things go awry when villains from Earth-X attack the ceremony. All of the superheroes band together with help from their super friends like Citizen Cold (guest star Wentworth Miller), The Ray (guest star Russell Tovey), Felicity Smoak (guest star Emily Bett Rickards), Iris West and Alex Danvers (guest star Chyler Leigh) to take on their most formidable villains yet. Earth’s mightiest heroes – Green Arrow (guest star Stephen Amell), Supergirl (guest star Melissa Benoist), The Flash (Grant Gustin) and White Canary (guest star Caity Lotz) – lead their teams into battle to save the world. Dermott Downs directed the episode with story by Andrew Kreisberg & Marc Guggenheim and teleplay by Todd Helbing. THE EPIC FOUR-WAY CROSSOVER WITH “ARROW,” “SUPERGIRL,” “THE FLASH” AND “DC’S LEGENDS OF TOMORROW” CONCLUDES — Barry (guest star Grant Gustin) and Iris’s (guest star Candice Patton) wedding brings the gang together, but things go awry when villains from Earth-X attack the ceremony. All of the superheroes band together with help from their super friends like Citizen Cold (guest star Wentworth Miller), The Ray (guest star Russell Tovey), Felicity Smoak (guest star Emily Bett Rickards), Iris West and Alex Danvers (guest star Chyler Leigh) to take on their most formidable villains yet. Earth’s mightiest heroes – Green Arrow (guest star Stephen Amell), Supergirl (guest star Melissa Benoist), The Flash (guest star Grant Gustin) and White Canary (Caity Lotz) – lead their teams into battle to save the world. Gregory Smith directed the episode with story by Marc Guggenheim & Andrew Kreisberg and teleplay by Phil Klemmer & Keto Shimizu.